Will the sun shine on us? 2. Time to look at some details: So, is Malga Brigolina in sunlight at lunch time? [well, the weather was close to clear sky conditions but mountains are high here and cast long shadows in winter time]. A rather easy task I thought, so I got my tools ready since that was an occasion to verify the predictions with some photos! Thanks to the new EU-DEM at 25m I was able to perform the computations right away in a metric system rather than dealing with degree in LatLong. Direct sunlight can be assessed from the beam radiation map of GRASS GIS’ r.sun when running it for a specific day and time. But even easier, there is a new Addon for GRASS GIS 7 which calculates right away time series of insolation maps given start/stop timestamps and a time step: r.sun.hourly. This shrinks the overall effort to almost nothing. The first step is to calculate where direct sunlight reaches the ground. Here the input elevation map is the European “eu_dem_25”, while the output is the beam radiation for a certain day (15 Dec 2013 is DOY 349). Important hint: the computational region must be large enough to east/south/west to capure the cast shadow effects of all relevant surrounding mountains. The ten resulting maps contain the beam radiation for each pixel considering the cast shadow effects of the pixel-surrounding mountains. However, the question was not to calculate irradiance raster maps in Wh/m^2 but simply “sun-yes” or “sun-no”. So a subsequent filtering had to be applied. Each beam radiation map was filtered: if pixel value equal to 0 then “sun-no”, otherwise “sun-yes” (what my friends wanted to achieve; effectively a conversion into a binary map). r.mapcalc "$map = if($map.tmp == 0, null(), 1)"
As a result we got ten binary maps, ideal for using them as overlay with shaded DEMs or OpenStreetMap layers. The areas exposed to direct sunlight are shown in yellow. Trento, direct sunlight, 15 Dec 2013 between 10am and 5pm (See here for creating an animated GIF). Quality reduced for this blog. 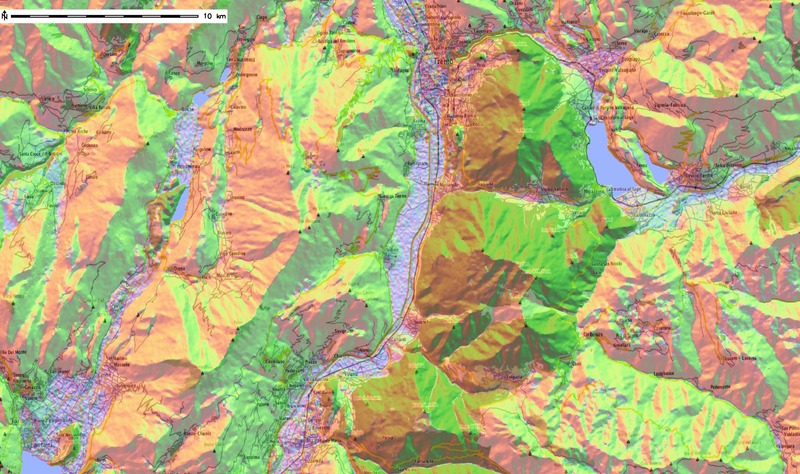 Sunlight map blended with OpenStreetmap layer (r.blend + r.composite) and draped over DEM in wxNVIZ of GRASS GIS 7 (click to enlarge). 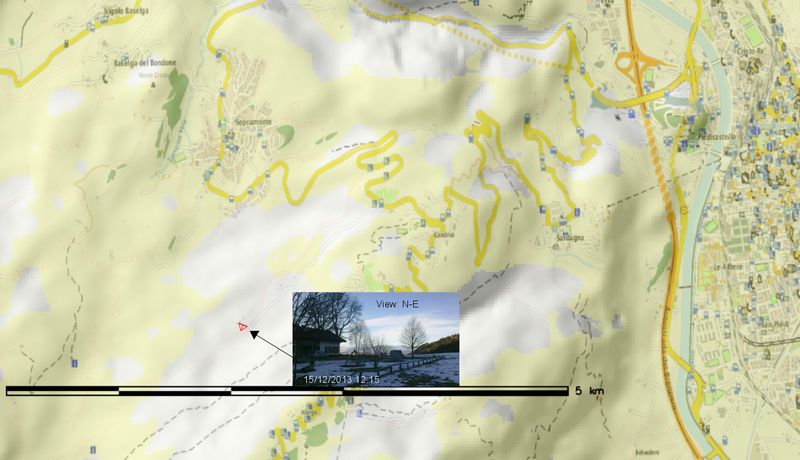 The sunday walk path around Malga Brigolina is the blue/red vector line shown in the view center. The resulting sunlight/shadow map appear to match nicely realty. Perhaps r.sun.hourly should get an additional flag to generate the binary “sun-yes” – “sun-no” maps directly. 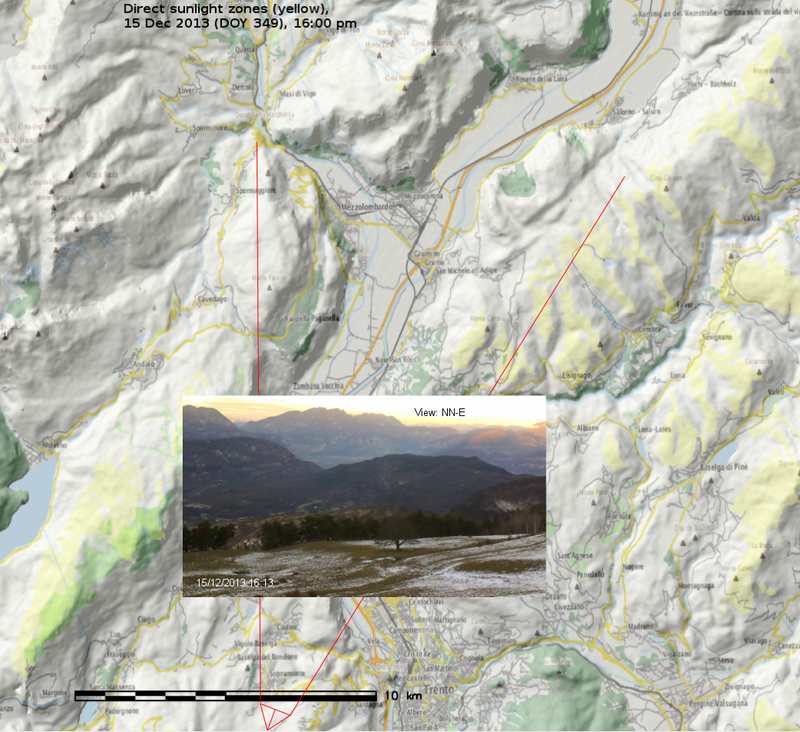 This entry was posted in Blog, DEM, elevation, GRASS, OpenStreetMap, Solar on December 27, 2013 by neteler. Inspired by Vaclav Petras posting about “Did you know that you can see streets of downtown Raleigh in elevation data from NC sample dataset?” I wanted to try the new GRASS GIS 7 Addon r.shaded.pca which creates shades from various directions and combines then into RGB composites just to see what happens when using the new EU-DEM at 25m. 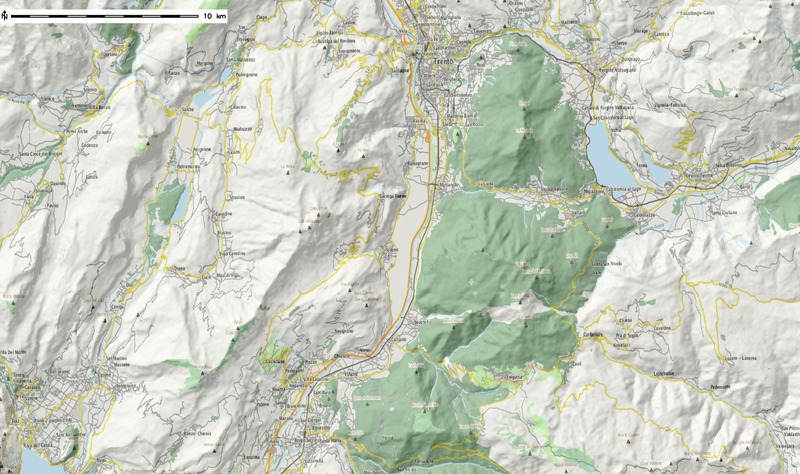 This entry was posted in Blog, Cartography, data, DEM, elevation, GRASS, OpenStreetMap on December 15, 2013 by neteler. It is fairly easy to create 3D buildings from OpenStreetMap (OSM) maps, essentially by extruding the 2D footprint polygons to 3D. 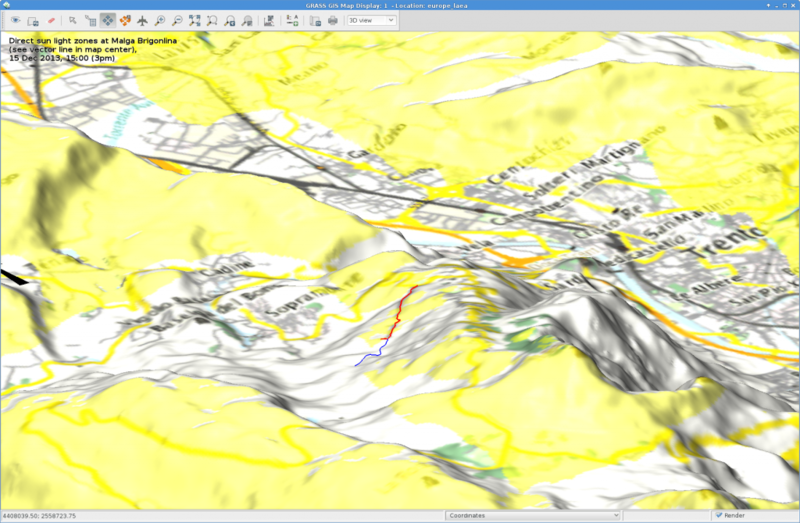 This entry was posted in 3D, OpenStreetMap, OSGeo on October 23, 2011 by neteler. OpenStreetMap data is used as the basemap for http://www.whitehouse.gov/change/ with the map rendered with OpenLayers. Great achievement! 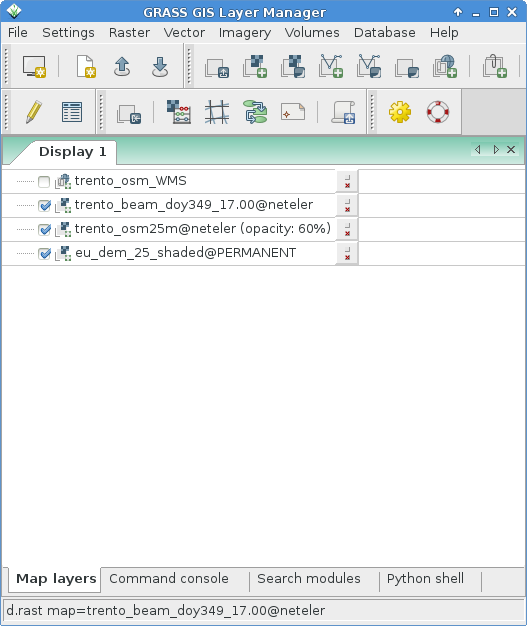 This entry was posted in OpenLayers, OpenStreetMap, OSGeo on May 3, 2009 by neteler.